The relationship between periodontal health and the restoration of teeth is intimate and inseparable. Human teeth are designed in such a way that the individual tooth contributes significantly to their own support as well as collectively the teeth in the arch. Decay on the proximal surfaces occurs mainly due to the faulty interrelationship between the contact area, marginal ridge, the embrasures and the gingiva. An adequate understanding of the relationship between periodontal tissues and restorative dentistry is paramount to ensure an adequate form, function, aesthetics and comfort of the dentition. For long-term survival of restoration, both functionally and esthetically, certain biological considerations are very critical to preserve the health of the periodontium and thus must be given due importance in clinical practice. While most clinicians are aware of this important relationship, uncertainly remains regarding specific concept such as biologic width and its maintainces. Restoring the proper anatomy of the tooth and maintaining the health of the soft tissue should be a prime consideration during the restorative procedure. This article reviews the clinical considerations that need to be adopted while restoring a natural tooth and or implant restoration. A through examination is necessary to provide comprehensive dental care the patient so as to establish a good oral health. A review of general medical status and past dental history is necessary as it influences the treatment plan. Review of general health helps to identify systemic health problem that may modify the dental treatment that is necessary. Common communicable diseases such as herpes simplex, chicken pox, mumps, etc. should be diagnosed and special infection control measures or delaying the treatment may be required. Generally, choice of dental filling material should be based on the patient's case history, clinical, radiographic and other relevant findings. The dentist must decide whether or not to restore the tooth and, if restoration is required, which restorative material to employ for the anticipated situation. Strength of remaining tooth structure. Specific characteristics of the patient's dentition and periodontal health. Patient's oral hygiene and dental caries history. Financial costs of the procedure to the patient. Risks and benefits of the procedure to the patient. Ability of the dentist to perform the procedure. Preferences of the dentist and the prevailing standard of care. The life of dental restoration depends on material and procedure, size and location of the restoration, chewing habits, oral hygiene and its maintenance, and systemic conditions. Material related factors include strength; wear resistance, tolerance to water, dimensional stability and colour stability. Because each restoration has unique circumstances that profoundly affect its lifetime. This article does not attempt to discuss or predict longevity of service for any of these materials but it discus about restabilising a single tooth in proper form and function. Establishing the interproximal contact is the primary objective of restorative procedures. Ideal Proximal contact acts as a barrier against food impaction and thus contributes to underlying periodontal health. By providing food spillway and facilitating hygienic cleaning. Contact point has been defined as the point when teeth erupt and acquire proximal contact with adjacent tooth proximal attrition leads to the conversion of contact point to contact area. Creates a natural embrasure providing a opportunity for good maintenance of the interproximal area. It is imperative to have a marginal ridge of proper dimension, compatible to the occlusal anatomy creating a pronounced adjacent triangular fosse and occlusal embrasure. Marginal ridge should always form in two planes bucco-lingually meeting at a very obtuse angle. This feature is essential when an opposing functional cusp occludes with the marginal ridge. These essential features are necessary to prevent food lodgement which causes damage to the periodontium. 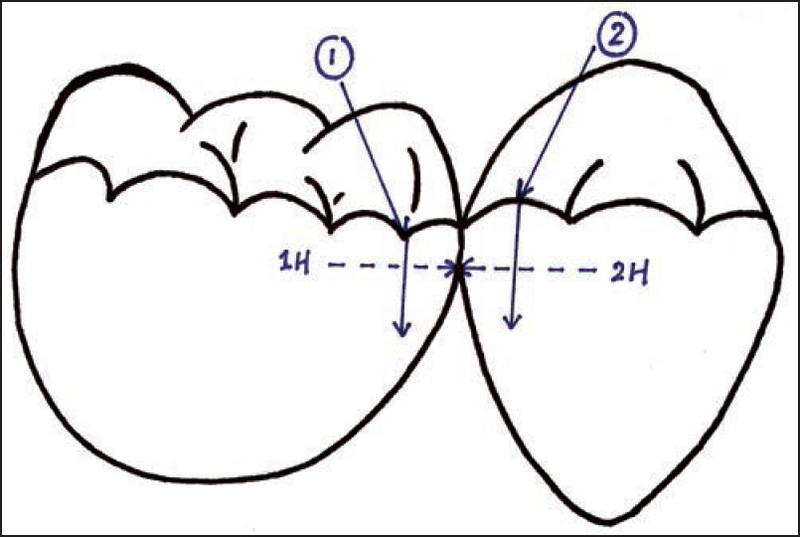 The forces 1will be directed towards the proximal ridge of the adjacent tooth and force 2 is directed on to the same tooth, so the horizontal forces 1H and 2H will act on the same tooth, which will tend to drive the two teeth away from each other. The vertical component 1V and 2V can impact the food intraorally [Figure 2]. 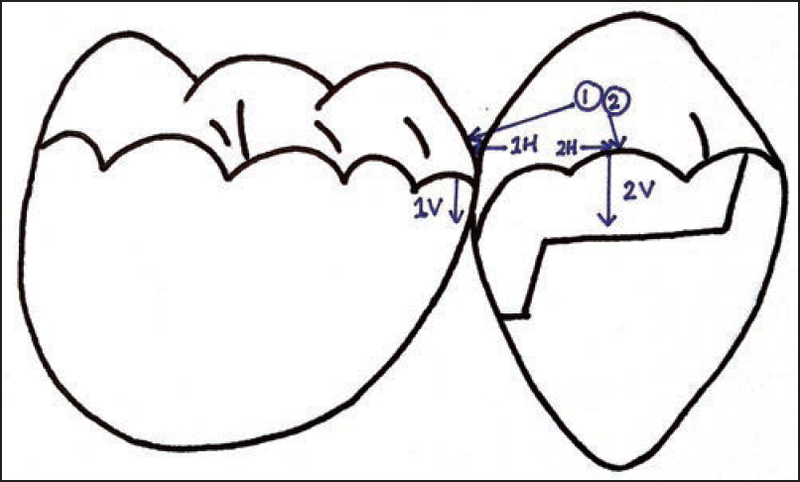 Restoring the marginal ridge higher than the adjacent one will allow force1 (A) on the proximal surface of the restoration, the horizontal component 1H (AH) will drive the restored tooth away from the contacting tooth and the vertical component will push debris interproximally even in the presence of force 2 (B) with its horizontal component (BH) acting on the adjacent marginal ridge there is some separation of the teeth as force 2(B) is too small as compared to force 1 (A). 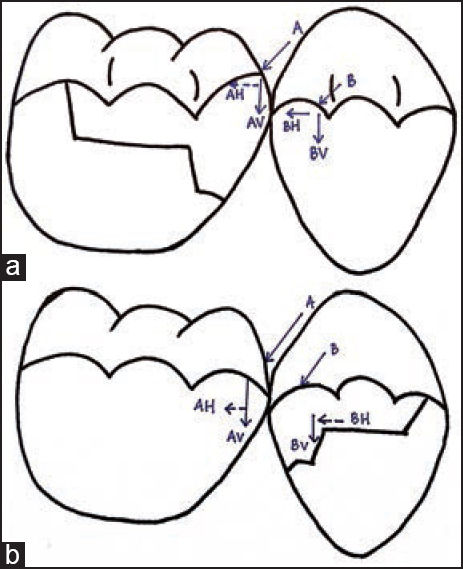 By restoring the marginal ridge lower than the adjacent one we can expect the same movement of the tooth but the major movement will be non restored tooth [Figure 3]a and b. 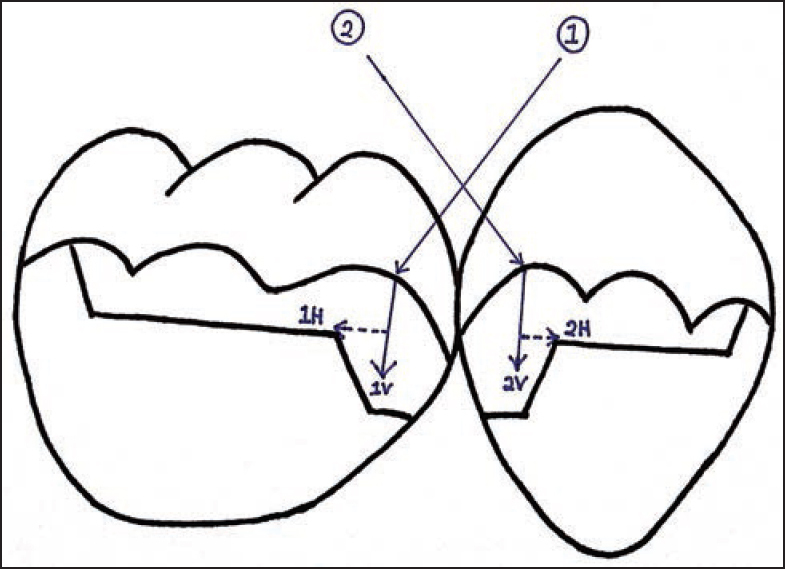 In this situation there are no occlusal plans in the marginal ridges, so there are no occlusal forces acting 1 and 2, so there are no horizontal component 1H and 2H to drive the tooth toward each other and vertical force 1V and 2V will impact the food interproximally [Figure 4]. This can create the premature contact during both function and static occlusion, one plan marginal ridge increases the depth of adjacent triangular fossa by increasing the stress in this area and also increases the height of the marginal ridge at the centre, and this will deflect the food away from the spillway [Figure 5]. Will be susceptible to fracture or deformation leading to the problems of previously mentioned faulty marginal ridge (discussed in point 1, 2, 3 and 4) [Figure 6]. Dentine forms the bulk of the tooth and a protective encasement for the pulp. As the vital tissue without vascular supply and innervation it is nevertheless able to respond to thermal, chemical, or tactile external stimuli. Of the various forms of treatment, operative procedures are the most frequent cause of pulpal injury. Trauma to the pulp can't always be avoided, particularly with extensive restorations. A competent clinician, recognizing the hazards associated with each step of the restorative process, can often minimize if not prevent, trauma to preserve the vitality of the tooth. The deleterious affect and its effective management are mentioned in [Table 5]. 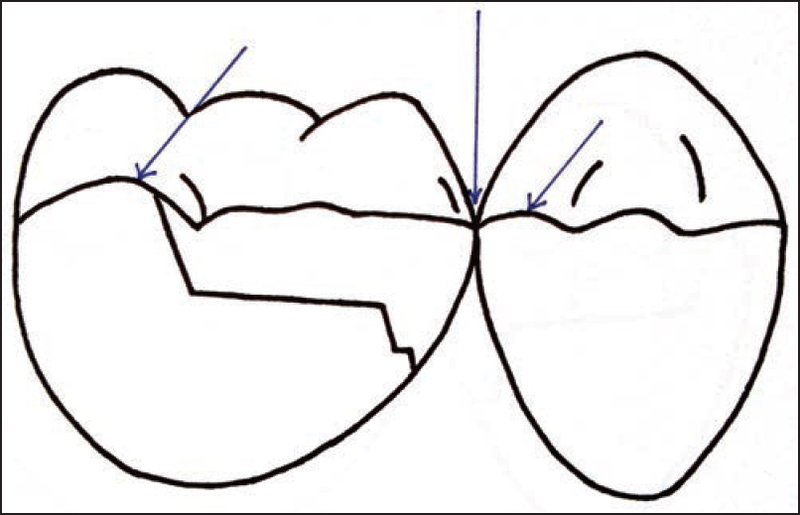 An exaggerated occlusal embrasure because of faulty marginal ridge will direct force 1 and 2 towards adjacent proximal surfaces with the horizontal component driving the tooth away and the vertical component 1V and 2V pushing the debris into proximally [Figure 7]. Absence of occlusal embrasure because of faulty marginal ridge will act like a pair of tweezers grasping the food. Although debris won't be pushed interproximally it will be very difficult to remove [Figure 8]. Integrity of the dental papilla is the main concern while restoring the tooth. The absence and loss of interdental papilla which intern leads to absences or loss of embrasure may cause aesthetic impairment, phonetic problems, and food impaction. Gargiulo et al., reported that marginal width is commonly about 2.4 mm, which represents the some of epithieal and connective tissue measurements that is sulcus of 0.69 mm, epithelial attachment of 0.97 mm and a connective tissue width of 1.07 mm. 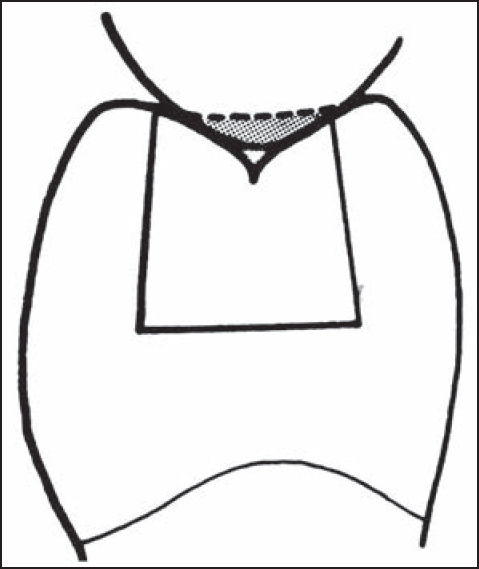 The width is not constant it varies according to the location of the tooth [Figure 9]. Traditionally this type of margins were not desirable, as it favors to lot of food accumulation which leads to increased gingival inflammation and also concern was the minor gingival recession would create an unsightly margin display. Biologic width violation leads to chronic progressive gingival inflammation, Clinical attachment loss and alveolar bone loss. Gingival hyperplasia is also most frequently found in subgingivally placed restorative margins. Surgical correction is aimed at removing the bone away from the restorative margin done by gingivectomy, apically repositioned flap with or without ostectomy. Orthodontic correction, the tooth is moved coronally away from the bone is done either by slow eruption or forced eruption with supracrestal fiberotomy. The ultimate long term success of implants is largely relied upon the interphase between implants and their surrounding tissues, both hard and soft tissues. Dental implant have two distntic interface with oral tissues. The soft tissue- implant interface is where the peri-implant mucosa meets the implant creating a biological seal to prevent future disease invasion. Due to the natural of the tissue component, soft tissues surrounding the dental implants are called peri- implant mucosa instead of gingival. The successful integration of periodontal and restorative dentistry for both natural teeth and implant requires knowledge and application of both biological and mechanical principles. Subgingival margins should be considered as a compromise and supragingival margins are preferred. Where the aesthetic is not a concern and adequate tooth structure exists, supra gingival margins are recommended. In areas with the inadequate tooth structure crown lengthening or orthodontic extrusion can be used to increase clinical crown lengthening. For subgingival placement of the dental implant several principles should be considered. The marginal fit should be optimal because of the rough surface or open margin leads to bacterial accumulation that are associated with inflammatory periodontal disease. The margins of the implant should extend only slightly into the gingival sulcus, to avoid violation of biologic width. Materials used in the restorations should be compatible with the soft tissue and lend themselves to the precise interface to minimize marginal discrepancies that encourages retention of bacterial plaque. Has the interphase coronal to facial and lingual bone. Provides the closest possible implant/abdument interface. 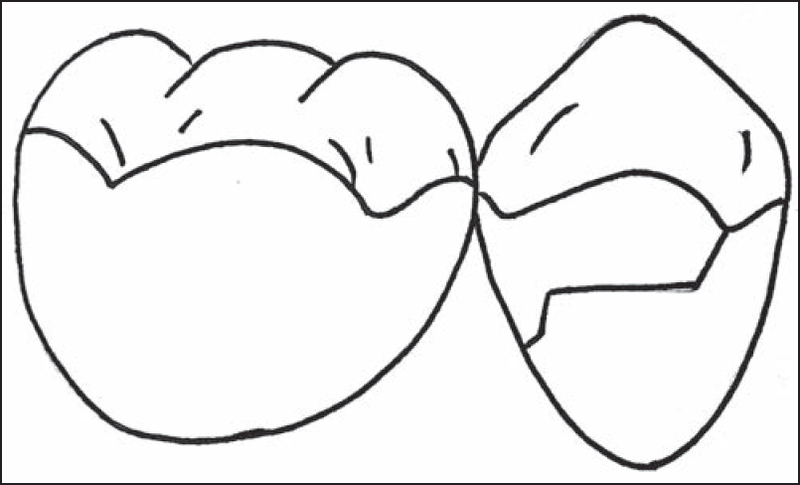 An operator should have a through knowledge of restorative design, materials and technique when examining the badly mutilated teeth following steps should be taken before finalizing that design and executing it. Evaluate the P-D organ and the periodontium of the tooth to be restored, preferably before the patient is anesthetized. Remove all the undermined enamel. There is no place for such enamel in all permanently restored posterior teeth. Clean all surrounding walls from dentin that is infected. If the tooth destruction is located supragingivally, no need for the any change in the periodontium. If the tooth destruction is located apically to gingival cervice but suprabony, gingivectomy is performed to expose the apical limit of defect. Full thickness mucoperiosteal flap is raised with osteotomy to correct the defect. Intentional extrusion of the tooth is done. The relationship between restoration and periodontal health of the teeth is intimate and inseparable; maintenance of gingival health constitutes one of the keys for tooth and dental restoration longevity. An adequate understanding of relationship between periodontal tissues and restorative dentistry is paramount to ensure adequate form, function and aesthetics and comfort of the dentition. The clinician should have an adequate knowledge about anatomy and the functional aspects of contacts and contour so as to reproduce using proper restorative material. Recent updates with extensive knowledge about the matrix system will help to reproduce the normal anatomy and contacts between the teeth which will help in maintaining the healthy oral cavity. In spite of the increase emphasis on the perio-restorative interphase in restorative dentistry, many dentists have been unable to utilize the concept of biological width in a practical manner, so this article is briefed about the clinical considerations during restoration. Ramya R, Raghu S. Optimizing tooth form with direct posterior composite restorations. J Conserv Dent 2011;14:330-6. Goldberg PV, Higginbottom FL, Wilson TG. Periodontal considerations in restorative and implant therapy. Periodontol 2000 2001;25:100-9. Roberson TM, Heymann H, Swiff EJ. Sturdevent′s Art and Science of Operative Dentistry. 4 th ed. Maryland Heights; Mosby Publications; 2002,389-99, 410,174-7 & 33-5. Ramya R, Raghu S. Clinical Operative Dentistry Principles and Practices. 2 nd ed. Bangalore: EMMESS Medical Publishers; 2011, 190. Appendix I - The Benefits of Dental Amalgam. Ad Hoc Subcommittee on the Benefits of Dental Amalgam - materials, methods and indications for the restorations of posterior teeth. ADA Council on Scientific Affairs. Direct and indirect restorative materials. J Am Dent Assoc 2003;134:463-72. Chuang SF, Su KC, Wang CH, Chang CH. Morphological analysis of proximal contacts in class II direct restorations with 3D image reconstruction. J Dent 2011;39:448-56. Khan FR, Umer F, Rahman M. Comparison of proximal contact and contours of premolars restored with composite restoration using circumferential matrix band with and without separation ring: A randomized clinical trial. Int J Prosthodont Restor Dent 2013;3:7-13. Eissmann HF, Radke RA, Noble WH. Physiologic design criteria for fixed dental restorations. Dent Clin North Am 1971;15:543-68. Vimal KS. Textbook of Operative Dentistry. 2 nd ed. New Delhi: CBS Publishers and Distributors; 2008:71-7. Linkow L. Contact areas in natural dentition and fixed prosthodontics. J Prostho Dent 1962;12:132-7. Marzouk MA, Simonton AL, Gross RD. Operative Dentistry- Modern Theory and Practice. 1 st ed. Tokyo: Ishiyaku EuroAmerica, Inc. Publishers; 1989: 240-5. Padbury A Jr, Eber R, Wang HL. 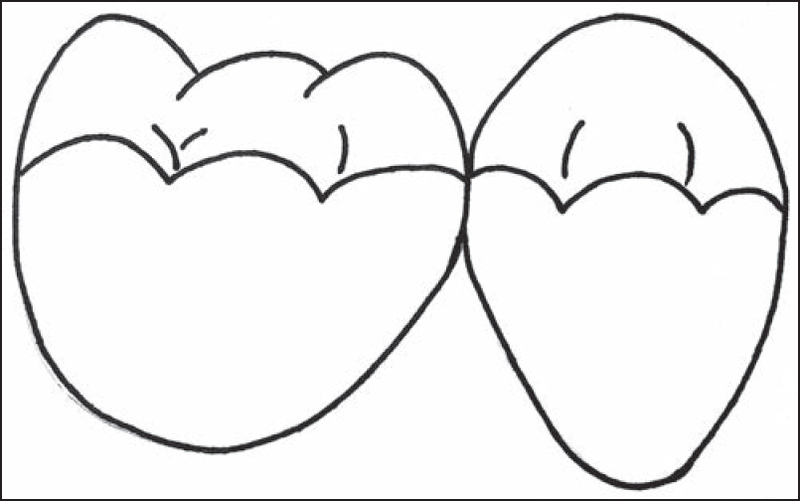 Interactions between the gingiva and the margin of restorations. J Clin Periodontol 2003;30:379-85. Palamara JE, Palamara D, Messer HH. Strains in the marginal ridge during occlusal loading. Aust Dent J 2002;47:218-22. Eshleman JR, Janus CE, Jones CR. Tooth preparation designs for resin-bonded fixed partial dentures related to enamel thickness. J Prosthet Dent 1988;60:18-22. Hansen AR, Asmussen E, Christiansen NC. In vivo fracture of endodontically treated posterior teeth restored with amalgam. Endod Dent Traumatol 1990;6:49-55. Mondelli J, Steagall L, Ishikiriama A, de Lima Navarro MF, Soares FB. Fracture strength of human teeth with cavity preparation. J Prosthet Dent 1980;43:419-22. Reeh ES, Messer HH, Douglas WH. Reduction in tooth stiffness as a result of endodontic and restorative procedures. J Endod 1989;15:512-6. Tandon S. Textbook Book of Pedodontics. 2 nd ed. New Delhi: Paras Medical Publishers; 2008:401. Baum L, Phillips RW, Lund MR. Textbook of Operative Dentistry. 2 nd ed. Philadelphia: WB Saunders Company; 1985:81. Prato GP, Rotundo R, Cortellini P, Tinti C, Azzi R. Interdental papilla management: A review and classification of the therapeutic approaches. Int J Periodontics Restorative Dent 2004;24:246-55. Nugala B, Kumar BS, Sahitya S, Krishna PM. Biologic width and its importance in periodontal and restorative dentistry. J Conserv Dent 2012;15:12-7. Jorgic-Srdjak K, Plancak D, Maricevic T, Dragoo MR, Bosnjak A. Periodontal and prosthetic aspect of biological width part I: Violation of biologic width. Acta Stomatol Croat 2000;34:195-7. Khuller N, Sharma N. Biologic width: Evaluation and correction of its violation. J Oral Health Comm Dent 2009;3:20-5. 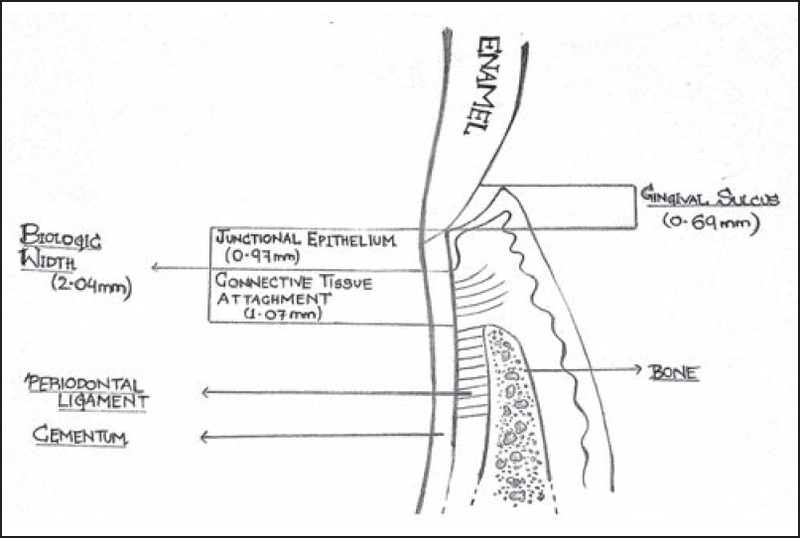 Waerhaug J. Healing of the dento-epithelial junction following subgingival plaque control. II: As observed on extracted teeth. J Periodontol 1978;49:119-34. Valderhug J, Birkeland JM. Periodontal conditions in patients 5 years following insertion of fixed prostheses. Pocket depth and loss of attachment. J Oral Rehabil 1976;3:237-43. Newman MG, Takie H, Klokkevold PR. Carranza′s Clinical Periodontol. 10 th ed. Philadelphia: Saunders; Elsevier Publishing; 2006:134. Shenoy A, Shenoy N, Babannavar R. Periodontal considerations determining the design and location of margins in restorative dentistry. J Interdiscip Dent 2012;2:3-10. Maheaswari R, Golla UR, Logarani, Sudagaran M, Rohan SB. Biologic width - critical zone for a healthy restoration. IOSR-JDMS 2014;13:93-8. Tsao YP, Wang HL. Periodontal considerations in implant therapy. Int Chin J Dent 2003;3:13-30. Chandra S, Chandra S, Girish C. Textbook of Operative Dentistry. 1 st ed. Delhi: Jaypee Brothers Medical Publishers Ltd.; 2007:337.